If your order weighs less than 13 ounces, save huge on shipping with USPS first class (with tracking number). This product weighs 9.6 oz. 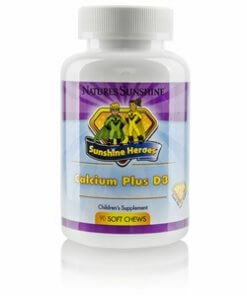 Nature’s Sunshine Sunshine Heroes Calcium Plus D3 provides 300 mg of calcium, equivalent to an 8-ounce serving of milk, as well as 140 mg of phosphorus, which works closely with calcium in the body to build strong bones and teeth. Vitamin D helps the body maintain healthy levels of calcium and phosphorus, and since calcium can only be absorbed by the body when vitamin D is present, D3 plays a vital role in the use and distribution of calcium to the body. 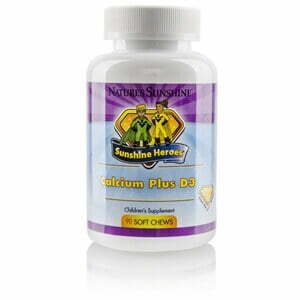 One serving of Sunshine Heroes Calcium Plus D3 provides 300 IU of the 400 Daily Value IU of vitamin D3.